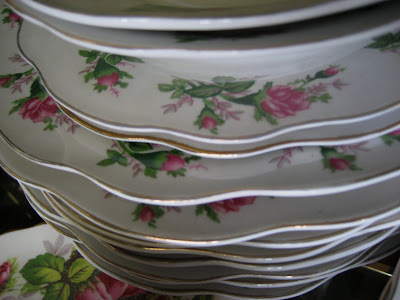 CONFESSIONS OF A PLATE ADDICT: A Flea Market Treasure Hunt! 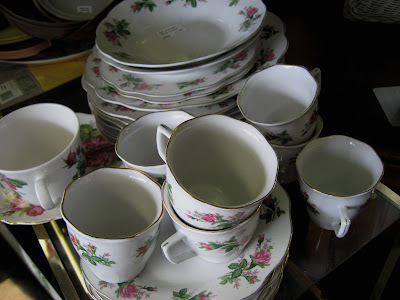 A Flea Market Treasure Hunt! ...and with Linda as my fearless captian, we embarked on our treasure hunt! Come aboard, mateys! A collection of items greeted us outside the door, including this little cabinet for $15...OK, not bad so far. 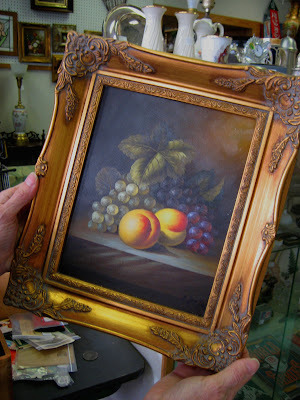 Linda immediately spotted this little oil painting in a gorgeous frame for $24...pretty good! OK...now we are getting warmer! This set of 25 dishes for $11.50....not bad at all! I am not a pinky, rosy person, but I must say they are pretty! I didn't get the make. Oh now, this is cute!! 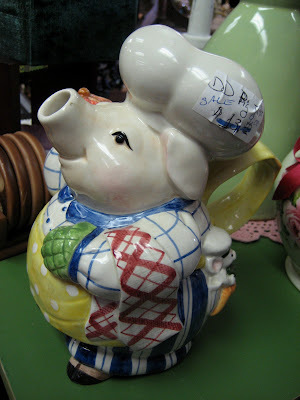 A pig pitcher for only $9! Look at the mouse in his pocket! I am starting to relax. Maybe this is OK after all! These look familiar! 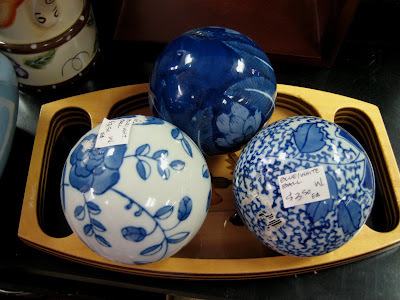 Carpet balls/bowls at $3.50 each! 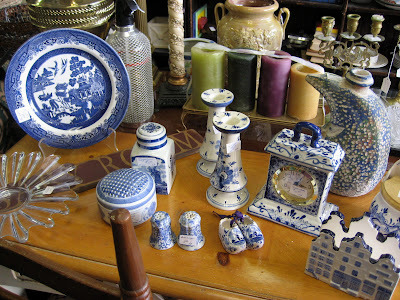 Here's a variety of blue and white thingys ranging from $3 to $15...cute! This blue moon candle holder caught my eye...$9! Woah! Blue and white toile chandelier shades at $1 each!! The chest behind them was $89. Is that a dead man's chest?? Yo ho ho!! 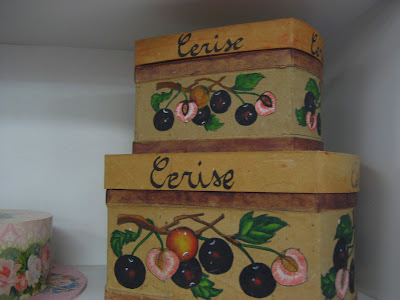 Now these are cute and very frenchy...boxes that say cerises...cherries...at $3 each! Here are some cute banks! The mouse is $10 and the doggie is $6!! They could hold a lot of gold dabloons! 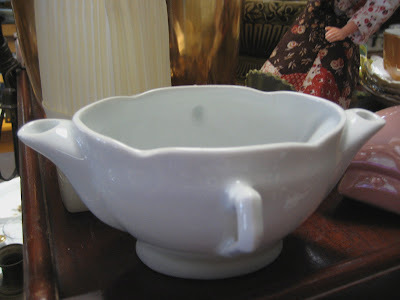 A two-sided gravy boat...only $2...wish I had bought this one! 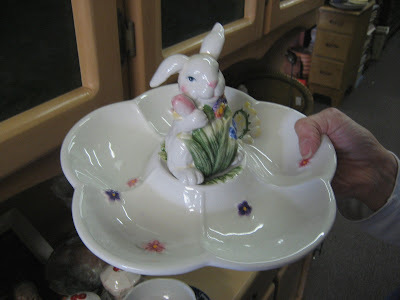 Here's Linda's favorite...a cute bunny tray for $5.75! 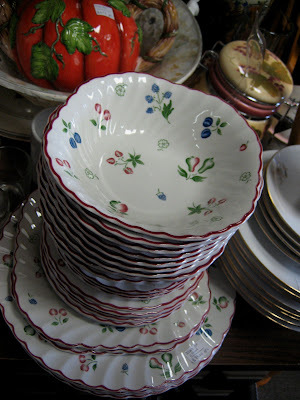 And here's a stack of Johnson Brothers dishes...25 for $39, but no dinner plates. Too bad! 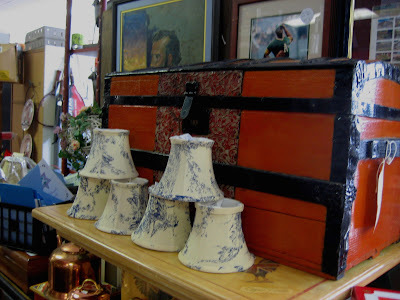 You have to have imagination for this one...paint it cream and antique it...only $3.50! Hey....I'm starting to get the hang of this! It's actually fun!!! Ohhh! Here's a cute plate! Do you see the bunnies??? Only $3.50! 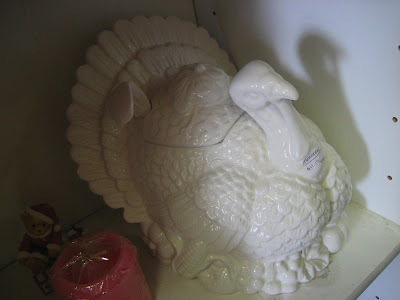 Do you need a turkey tureen? It's $11.50! Ohhh! I can't walk past this one! 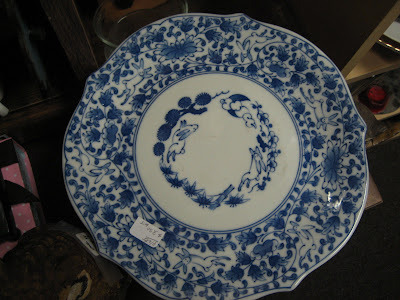 White ironstone with grapes...$8 plus they give a 10% discount if you ask...so $7.20! This baby is going home with me! Hmmm...can't read the mark....oh well, I like it no matter what! OK, Linda...I am not totally horrified! Maybe you are right! Let's purchase our booty...er...goodies and head out for lunch...after a thorough decontamination with numerous antibacterial wipes and a good scrubbing of hands, of course!! As soon as I got home, I started cleaning up my treasure. Woah!!! What's this??? Does this say...?? Is it my imagination...?? I rush into the dining room and check the mark on my mom's soup tureen! I'm doing the happy dance!! Do you see?? Yes, it's Red Cliff ironstone! Just like my mom's soup tureen!!! Woooo hooo!! See how wonderful it looks beside its new friend? Baby Kitty even agrees! I had to call my friend Linda and tell her immediately!! We looked on ebay....$24 plus $12 shipping! And I got mine for $7.20!! Here it is in its new home on my hutch! What do you think of my treasure?? OK, Linda...you can print this post and hold it over my head forever! You were right! Sooooooooo...when can we go back??? OH MY!!!!! I want to come too!!! I need to move to GA. You guys have all the good stuff for the good prices. I'm in California . . . I rest my case!! Oh I so enjoyed going shopping with you. LOVE the tureen!!!! I cannot believe you drove by that place for 11 years. My gosh. Love the name of your blog. We are birds of a feather! I am such a dishaholic! Pretty scary!!!! I have been once. Is this the one in chamblee? I think I have been to that one. Anyway, just have a min, but wanted to say hi and I'm looking forward to meeting you too. Okay...where is this joint. I don't mind a little dust and dirt..You do go to Scott's Yes?? oh my... I need to go! Debbie I know you have been trying to get on my blog. Thank you for trying. I never go to my blogger acc... but tonight I did and saw your comment. Oh how I wish I lived in the area. CC told me about the little get together. I used to live in Dunwoody years ago and now we are back home in Canada. I still come and see all your pretty things. Thanks for the tour. That's it, I have to go thrift shopping tomorrow! Great blog and great pictures! What great stuff they have, I wish I could go with you two!! I love your purchase, maybe it could also double as a vase for fresh cut flowers? I would have scooped up that set of 25 dishes for $11.50. I agree 100%, not bad at all! Have a great weekend, Nicole. I have this huge feeling that I would be sooooo in trouble in that store! I like what you found, and especially that it's marked! Happy Valentine's Day! I LOVE IT ALL DEBBIE! Isn't it amazing what treasures you can find in the midst of a mess. Enjoyed the trip! Yippee!! 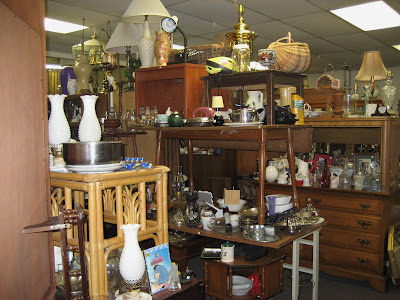 Debbie, you and Linda hit the jackpot.. well at least we know you did..:-) what great treasures did our Linda take home? 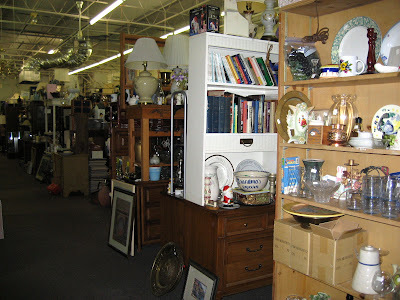 I hope you and your little sweetie have a fantastic Valentine's evening..
Wow, great treasures at that thrift shop. What's a little dirt among friends, after all? You made a great choice and got a great bargain with the candleholder. Hmm... I sure liked that little bunny tray. Too bad NJ is so far from GA! 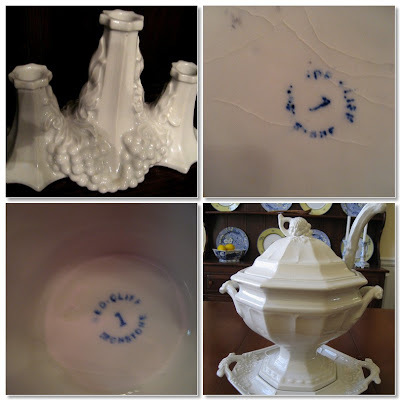 LOVE the tureen--what a find! I could NOT believe those prices! To my knowledge prices like that do not exist in Californa...anywhere. Goodwill? Maybe, IF they ever got things like that which they never seem to. At least not our Goodwill. YOU DID GOOD! Yes, you should definitely go back. Never let a bit of dust stop you..OR a lot of dust for that matter! Your candle stick looks fantastic where you put it. Very elegant!! Happy Valentines Day! It is fun getting to know you! You found some great bargains! I'm like you, a place that big is just too much for me. I really like the two things that you found. Debbie, this post is an absolute hoot. From the "ominous" music playing to the hand wipes... I'm laughing so hard I'm crying here! Oh, my friend, we have so much in common! LOL! I'm glad you perservered and got that candleholder. It's neat! And how great that it matches your tureen. Yep, I think the treasure hunt was worth it. Okay, I am signing out. Hope you and your grandson have a very special Valentine's Day together! Wishing you much, much love and happiness! So glad you didn't pass up the candelabrum. I think it may be from the same line as your soup tureen based on the grape motif on both. Wonderful find. Think how much more it would have cost if they had already cleaned it. Hey, they also have McDonald's in China. So even if your GS decides on McD's instead of Chinese take out, your beautiful, thoughtful, and very engaging tablesetting will work just fine. Bon appetit! That's what friends are for - to hold your hand and walk with you through the dirt and dust, the mountains of junk where, together, you can plunder to find treasures. See that's all you needed! I could tell you were having fun - I saw all those exclamations marks. lol! Glad you did find that treasure! Oh man! I hear you on the ickyness factor. I have an antiques market nearby, but the smell usually stops me cold. I long for the outdoor fleas they have in NYC and elsewhere. Guess Michigan's too cold to ever hope for one here. Do you think a clothespin is too obvious?? What a treasure!! I'm so glad you braved it and went back, wipes in hand. It was certainly worth it. Happy Valentine's Day. I hope you have a fantastic day today. Oooh I would have bought it all! Thank you for the tour and Happy Valentine's Day! Don't you just think sometimes things are meant to be....if your friend hadn't enticed you back there would have been no wonderful candle holder to go with your Mums soup tureen....wonderful. Really enjoyed this browsing. Thanks. What a fun time you had. 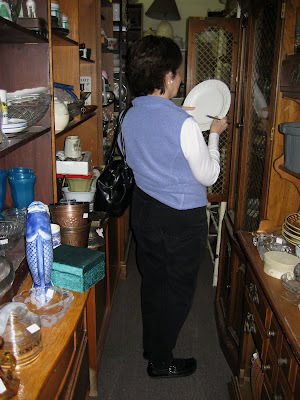 It's always nice to shop with a friend - especially a friend with an eye for treasures. I love the ironstone candle holder. I did have to laugh at the antibacterial clothes because I keep them in my car, along with hand sanitizer. You never know when you'll need them. Lol about this one! Bacteria? Who cares if there is good stuff...(we do have an immune system : - ) ) I love that you found a piece of Red Cliff...the photo of Baby Kitty with the tureen and candleholder just made my day! You found some awesome things. I love piggy collectibles and I am a plate collector myself. I love the soup toureen you picked up too. Just spending a leisurely Sunday afternoon visiting with my friends...so wanted to stop by to say hello! Girl, I loved our shopping trip...and you really found a treasure in that pretty Red Cliff Ironstone candleholder...I just adore it!!! If I had seen it, I would have scooped it up for sure...you did great!!! 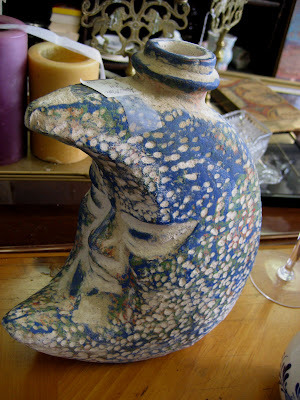 You know, the Red Cliff Ironstone is my favorite...I keep looking for pieces and it's very expensive! You made off like a bandit with that pretty piece! Congrats Sweetie, I'm so happy for you! Wonderful find Debbie! A good eye... is a good eye... ya know! I have to admit, I am frequently overwhelmed by cluttered, dusty treasure troves... maybe I'll start keeping some of those anti-bacterial thingies with me too! Your favorite place is now My Favorite Place! Hi Debbie, thanks for picking me up, I enjoyed our little "junking" trip. And I was thrilled to find your comment the other day, my very first one! Oh, and no worries about Mr. Darcy, I will wrangle with him again next year! Miss Debbie~I've thoroughly enjoyed your shopping venture. 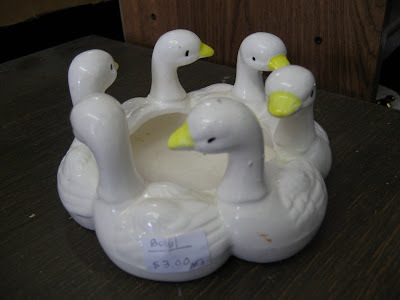 We're not so fortunate to have Antique Markets locally. You definitely have a keen eye to have found the Red Cliff ironstone candle holder. I'll have to remember the *wipes* tip, whenever I have opportunity to exercise my Antiquing muscles. 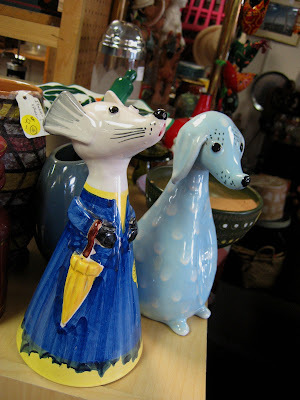 I'm hoping to take a trip home to Southern California, the mecca of Antiques/Flea Markets. My credit card will be left with smoldering skid marks,LOL! I haven't been there in about a year! That place is such a wonderful mess. I'm always afraid I'm going to knock something over and my husband refuses to come inside. But I've found some wonderful treasures there! Oh wow, I feel like I've been shopping! That was so fun, like tagging along. Have a good one.